+ What is the recording period for the winter fieldwork? + What is the recording period for the breeding fieldwork? Breeding season fieldwork runs from 1st April to 31st July inclusive. The recording period is divided into an early period in April/May and a late period in June/July, though we recommend late period visits be done in June if at all possible because bird activity tends to tail off in July. + Do I need to register to do the Atlas? No, anyone can submit Roving Records and there is no need to register in advance. However, to use the online system and submit these records online to see instant results you will need to register to get a BTO online username and password. This is very easy to do (click here, Coming Soon!). To do a Timed Tetrad Visit you must first speak to your Regional Organiser to get an available square. It is not essential to be an online user but again we very much encourage this because results can be seen much more quickly. + How do I give a full grid reference? A 10-km grid reference denotes a 10km by 10km square of the relevant (British or Irish) Ordnance Survey national grids. A full 10-km grid reference comprises a two letter prefix followed by two digits. You can add a single letter suffix to further denote the tetrad (2km by 2km grid square), e.g. SK45B. Click here for a worked example of how to give a grid reference. Tetrads are 2km by 2km squares. There are 25 tetrads in each 10-km square and each is identified by the grid reference of the 10-km square (e.g. SK45) plus a single letter suffix to identify the tetrad (e.g. SK45B). Tetrad codes run from A to Z (excluding O) from the SW (bottom left) corner to the NE (top right) corner as shown in the grid example. For more information on giving grid references click here. + I've found a rare breeding bird. How do you treat confidential records? Many formerly rare species are now much more widespread or now benefit from increased protection. Unfortunately, some species are still subject to persecution or egg collecting. In conjunction with the British and Irish Rare Bird Breeding Panel the Bird Atlas has developed a protocol for how accurately we will map records of confidential species. Basically we will only map certain species at coarse scales so as not to give away the precise breeding location. Some species will not be mapped under any circumstances. 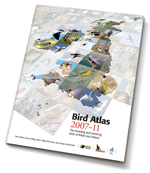 Any more precise information provided for the Bird Atlas project will remain confidential. To read the full policy click here. + Where can I get more survey forms? Click here (coming soon!) to view additional Roving Recorder forms that can be printed directly. If you require a large number, perhaps to distribute to birdwatchers, please contact the Atlas Coordinator (mailto, or call 01842 750050). Timed Tetrad Visit forms are only available by signing up to a tetrad through your RO. + Can I do a tetrad and submit Roving Records? + Why do I have to do an early and a late visit? + Do I have to survey the tetrad in winter and summer? + Can I survey more than one tetrad? + Should I maintain the same route through the season? Some summer migrants do not arrive until late May (e.g. Spotted Flycatcher) and a single visit in April would miss them. Also, a late season visit is useful for confirming breeding. It is best to try and get the late visit done in June if possible rather than leaving it until July when song activity can tail off. In winter we benefit from an early and late visit by catching movements of birds such as those that move into Britain in late winter following cold spells on the continent. If your tetrad is in a very remote area and is hard to access you can make a single 2 hour visit. If you are doing many tetrads in a 10-km square try to spread the visits so that some are early and some later rather than all early or all late (which might miss certain species). Better still, try to make the visits in mid season (May-June) so as to coincide with peak activity of as many species as possible. Your route should take you through all the major habitat types in the square. Don't be tempted to ignore open farmland or urban areas - all are equally interesting when it comes to putting the distribution maps together. No. You must arrange which tetrad(s) to survey through your Regional Organiser. Tetrads only need to be visited in one year so we do not want duplication. Moreover, there are target tetrads for coverage so please speak to your RO. To find out who is your RO click here. You can of course submit Roving Records for any tetrads and 10-km squares without 'signing up'. No - just record what you see during your Timed Tetrad Visit. If you wish to return later, you can submit a Roving Recorder form with evidence of breeding. A basic visit lasts 1 hour in which you count all the individuals of all species you encounter. You can opt to do a second hour of counting but your tallies must be kept separate. If you wish you can also stay even longer to list additional species or to try and confirm evidence of breeding. + Do I need to provide breeding evidence for every record? There is no restriction - you can do the same route, or vary it. Only tetrads whose centre is above the low water mark are eligible for Timed Tetrad Visits. Remember the guidance is to cover the range of habitats present in the square. So this includes checking the intertidal and sea for species. Count only as far offshore as you are confident in identifying birds (and don't count beyond the theoretical boundary of the tetrad). + If my TTV tetrad overlaps the county/district boundary, should I be visiting both sides of the boundary? + How do I 'sign up' for a tetrad? + How many visits should I make? + What route should I take through the tetrad? + Can I survey any tetrad? + How long does a visit take? Yes, TTVs should be for a whole tetrad, even if it's part in one county/district and part in another. However, if you encounter any rare species, please keep a note of which county/district they're in, and inform the relevant Recorder. Certainly. You can survey as many tetrads as you like. We do have a target to get at least 8 tetrads surveyed with Timed Visits in each 10-km square. So if 8 have already been done it is better to move on and start doing tetrads in the next 10-km square to count towards its 8. In some areas county clubs are producing a local atlas alongside the national one and in those cases they are looking to survey all 25 tetrads in each 10-km square so there should be plenty to go around. + If I do my winter TTVs this winter, can I postpone my summer TTVs till 2009 because of work commitments? You do not have to survey the same tetrad in winter and summer but we are looking to achieve the target of 8 tetrads visited in both seasons, and it would be very useful to have information for both seasons from the same tetrad. In any case, it will be very interesting to go back in the other season and see what has changed. Yes you can do both methods - just remember that there is no need to submit the records of birds you see during your Timed Tetrad Visit on the Rover form, but everything else if fair game. Yes, if necessary you can postpone the summer visits but please tell your RO so they know. If a tetrad has been selected for coverage it should receive a pair of visits in that particular season. We would prefer the same tetrad to be surveyed in both winter and summer. So this means 4 visits in total, the 1st in November/December, 2nd in January/February, 3rd in April/May and 4th in June/July. Once a tetrad has received a pair of visits in the winter and a pair of visits in the breeding season it is complete and you can take on another tetrad in the next year. Tetrads should not be covered in all four years. + Should I use the same route in winter and summer? + My tetrad contains sea - what should I do? + What type of records do you want? Roving recorder forms can be used to submit any bird distribution and breeding evidence records. You might decide to go out and thoroughly cover a tetrad or 10-km square and use the Rover form to record all the species you see; you could use it to record a flock of swans seen from the motorway whilst on a long drive; even just to submit a record of a Sparrowhawk hunting through your garden. Basically any and all records count because they all contribute towards the cumulative species list for each square. + I don't know the tetrad. Is 10-km precise enough? If you cannot be certain which tetrad you were in then please submit the record at 10-km resolution. For more information on giving grid references click here. + How do I give a grid reference? No - just record what you see, but by all means go back to the site on a later date or spend longer observing if you think the species might be breeding. But always remember the welfare of the birds must come first and do not cause undue disturbance. You do not need to find nests to confirm breeding. Click here to read more about evidence of breeding. + Can I do both Roving Recording and a Timed Tetrad Visit? Yes. If already doing Roving Recording, contact your Regional Organiser to find out which tetrads are available for Timed Tetrad Visits. Click here to find out how to contact your Regional Organiser. + What is evidence of breeding?? + Where can I see definitions of breeding evidence codes? to see the full list of definitions and read more about evidence of breeding. + What to do concerning Schedule 1 species? Some rare and scarce breeding birds are protected under the Wildlife and Countryside Act 1981 as amended by the Environmental Protection Act 1990 and it is an offence to visit a nest of these species without a licence. A full list of these species and details of what to do if you encounter one of these species is given here. Click here to go to the BTO's Health and Safety guidelines.